Mikey McDonagh (Lennox Head, NSW) and Kirra-Belle Olsson (Avoca, NSW) have taken top honours at the inaugural Hydralyte Sports Shoalhaven Pro Junior, following a day of exciting performances in punchy two-foot peaks. After a relatively slow start to 2018, Mikey McDonagh (Lennox Head, NSW) was able to gain momentum through the rounds of the Hydralyte Sports Shoalhaven Pro Junior, eventually taking the win. McDonagh found a handful of average waves in the shifty lineup to notch up a 10.25 two-wave heat total and take victory ahead of Chell. Setting the goal to only make it through the first round in each of the Pro Junior events he entered in 2018, 14-year-old Lennox Chell (Avoca, NSW) surpassed his own expectations in Culburra Beach, claiming a runner-up finish. Chell caught an abundance of waves over the course of the final, scratching into 14 waves, but was unable to find the necessary 6.75 to take away McDonagh’s lead. The Hydralyte Sports Shoalhaven Pro Junior is Chell’s second final appearance from as many events. As a result, Chell was awarded the AirAsia Wave Of The Day award. Kirra-Belle Olsson’s (Avoca, NSW) dream of winning a Pro Junior came true today when she took down a blisteringly in-form Zahli Kelly in the Girls final. In what deteriorated into windswept peaks by finals time, Olsson was able to execute a variety of giant turns to muster up a respectable 12.50 to claim her maiden Pro Junior win. Zahli Kelly (Qld) continued to build on her three consecutive finals appearances, taking out the runner-up spot. Kelly remained busy over the duration of the final, catching 12 waves, however, she was unable to find the required 7.6 wave score to take away Olsson’s lead. Following the result, Kelly will retain the top spot on the World Surf League (WSL) Junior Qualifying Series (JQS) rankings. The elite three-day event ran from 25 – 27 May 2018 and featured the best junior surfers from around the country as they attempted to seal themselves a spot in the World Junior Championship. The Hydralyte Sports Shoalhaven Pro Junior was proudly sponsored by Hydralyte Sports, Shoalhaven City Council, Culburra Bowling Club, AirAsia, World Surf League and Surfing NSW. Competitors in the Hydralyte Sports Shoalhaven Pro Junior fought through a tricky second day of competition today as surfers endeavoured to seal themselves a spot in the final day of the event. Zahli Kelly (Qld) and Molly Picklum (Shelly Beach, NSW) cemented themselves as the first semi-finalists in the Girls division. Both Kelly and Picklum were able to claim respective quarterfinal wins, just prior to calling the event off for the day due to deteriorating conditions. Kelly was able to post an impressive 12.00 heat total while Picklum posted a low 7.25 heat total. 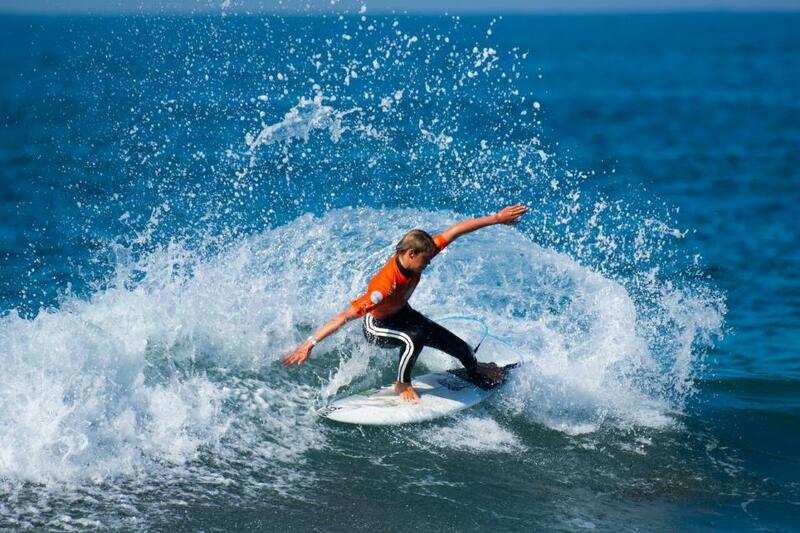 Kelly, who is currently leading the World Surf League (WSL) Junior Qualifying Series (JQS) rankings, will take on Picklum, who is currently third, in the semi-finals tomorrow. Kyuss King (Byron Bay, NSW) ensured he would jump a few places on the WSL JQS rankings, earning himself a spot in round three. King found multiple long-running right-handers over the course of the heat to notch up a decent 11.00 two-wave heat total. King will face Jett Schilling (USA), Keanu Miller (Bulli, NSW) and Ethan Hartge (Caves Beach, NSW) in round three tomorrow. Currently sitting in the fifth spot on the JQS rankings, Caleb Tancred (Avoca, NSW) looks certain to jump a few spots following the elimination of the top four surfers on the 2018 leaderboard. Tancred and Keanu Miller (Bulli, NSW) fought a tightly contested battle with both surfers locking in scores in the seven-point range and sealing themselves a spot in round three. Ethan Hartge (Caves Beach, NSW) took out the AirAsia Wave of the Day for his performance in round two, where he nailed himself a near-perfect 9.00 wave score in the final heat of Boys round two. The elite three-day event will run from 25 – 27 May 2018 and feature the best junior surfers from around the country as they attempt to seal themselves a spot in the World Junior Championship. The Hydralyte Sports Shoalhaven Pro Junior is proudly sponsored by Hydralyte Sports, Shoalhaven City Council, Culburra Bowling Club, AirAsia, World Surf League and Surfing NSW. Day one of the inaugural Hydralyte Sports Shoalhaven Pro Junior saw an exciting day of action as the first rounds of boys kicked off in difficult and bumpy two-foot surf. Adding to the excitement was the fact that nine of the top-ten rated male surfers on the Australasian World Surf League (WSL) Junior Qualifying Series (JQS) rankings advanced through the opening round of competition. Currently sitting in 17th position on the junior rankings, George Pittar (Manly, NSW) appeared more than eager to improve his placing as he annihilated an array of sections in his opening heat. Pittar was able to gain the edge in the heat thanks to a respectable 7.60 wave score to take the heat over impressive goofy-footer Hinata Aizawa (Burleigh, Qld). After a slow start to the 2018 JQS season, Tane Bowden (NZL) is eager to jump the rankings with a good result at Shoalhaven. Bowden got the ball rolling well in his opening exchange as he nailed an impressive 7.00 ride to get the upper hand over Xavier Huxtable (Jan Juc, Vic) and local surfer Navryn Watson (Culburra, NSW). Bowden executed an eclectic mix of sharp snaps and carves to take the heat win and earn a spot in the second round where he’ll meet Taj Watson (Coffs Harbour, NSW), Hinata Aizawa (Burleigh, Qld) and Boston Phillips (Sawtell, NSW). Visiting American surfer Jett Schilling (USA) appeared to be looking down the barrel of a first-round elimination as he sat in third position in the final minutes of his round one heat. However, Schilling was able to scratch into a punchy righthander in the final 30 seconds to post the mediocre score required to jump into a progressing position. Schilling progressed through the heat alongside Kyuss King (Byron Bay, NSW) who claimed the top-spot with a 13.10 two-wave heat total. Kirra-Belle Olsson (Avoca, NSW) took out the AirAsia Wave of the Day for her round one performance, where she sealed herself a near-perfect 9.65 wave score in the final heat of the day. The Hydralyte Sports Shoalhaven Pro Junior will commence each day at 7:30 am with the call for the day's schedule and location confirmed via the event hotline at 6:45 am. The event hotline number is 0458 247 212 which will leave a voice recorded message each morning of the event.